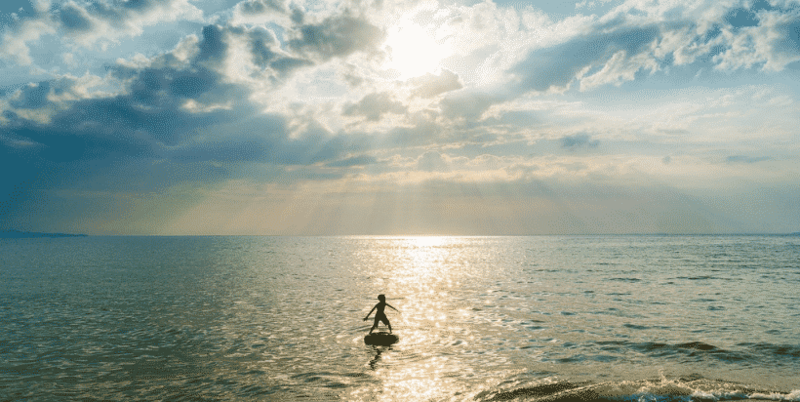 Winter won’t last forever, and if you’re the kind of person planning ahead, you’re probably looking towards your family’s spring break and all the possibilities that come with it. 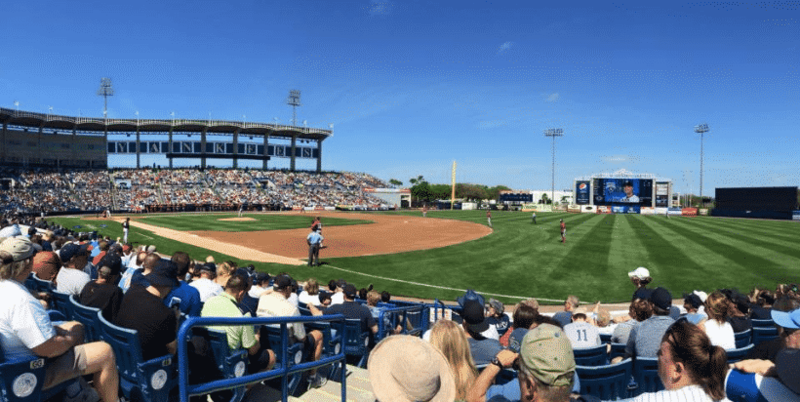 If you’re looking for sunshine, fun, and sports for your spring break adventure, consider visiting Arizona or Florida for Major League Baseball’s Spring Training. In these prime destinations, your whole family can enjoy a day at the ballpark watching your favorite big league stars play in smaller stadiums without breaking the bank. What better way to enjoy your vacation than partaking in America’s favorite past time while the rest of the country digs out of snow? For six wonderful weeks, all the Major League Baseball teams gather in either Florida or Arizona to get ready for the season. Leave the heavy winter coats behind! With average temperatures in the mid to high 70’s, you’ll also enjoy the perfect weather for morning hikes or afternoons at the campground swimming pool. One of the best things about spring training is the stadiums. If you go to the home stadium of one of these teams during a regular-season game, you’ll get seats so far away you need binoculars. During spring training, you can watch your favorite major league players in minor league sized stadiums. There’s nothing like seeing the action up close and personal without breaking the bank. You might even get lucky and snag a coveted autograph after the game! If you’re not already convinced what a great deal Spring Training is, take a look at ticket prices. You’ll pay significantly less than what fans will pay in the home stadium. Prices vary between teams (it might cost a bit more to see the defending World Series Champions during a weekend marquee matchup), but even a seat behind home plate will typically only run you $50, at most. Compare that to the hundreds of dollars that a seat like that would run you during the regular season, and it’s easy to see which one’s the better deal. It’s always nice to have options. 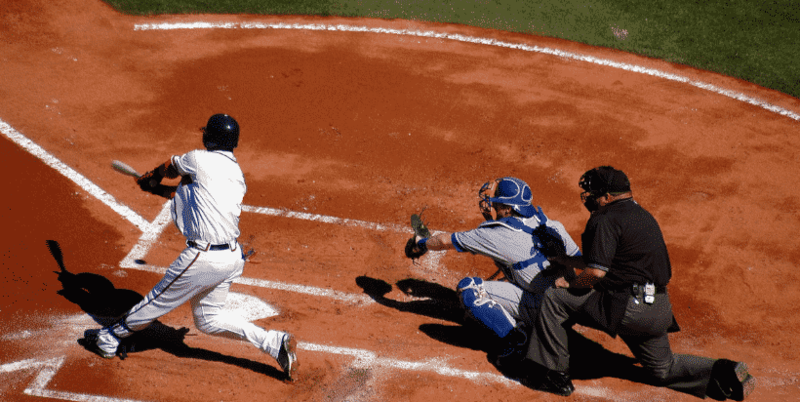 Major League Baseball’s Spring Training takes place each February and March in Arizona and Florida. Travel to see your favorite team play in either one of these two spring leagues for some prime family fun. There are 15 Major League Baseball teams that prepare for the season around Phoenix, Arizona, also known as the Valley of the Sun. See the Cactus League Map to see the location of the stadiums. This is a great place to go get some sun and enjoy some of the best baseball teams around. Enjoy nature and save a little money by camping at Usery Mountain Regional Park or Lost Dutchman State Park just outside of Phoenix. The other 15 teams train in Florida. Their stadiums are spread between both coasts with a few in central Florida offering fans plenty of options for a sun-splashed spring break. See the Grapefruit League Map to plan your trip now. 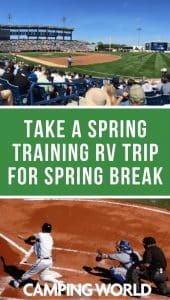 For a terrific camping option near gorgeous beaches and one of the Grapefruit League’s newer stadiums, try the Dunedin RV Resort. Even better, make it a double-duty vacation with Disney and the Atlanta Braves’ spring home by camping at Walt Disney’s Fort Wilderness. Now that’s a Spring Break RV vacation bound to make the entire family happy! What sounds like the best option for you? Leave a comment below! Julie and her husband Sean started traveling in their RV full-time 4 years ago after they each served 20 years in the US Air Force. Having lived in more than 10 states and 4 countries, the Chickerys decided it was time to enjoy the rest of the United States. They manage Chickery’s Travels, an educational and inspirational blog and YouTube channel aimed at helping people realize their full-time travel dreams.